It's a good year to be a Star Trek fan who collects stamps! 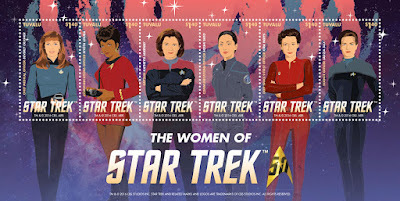 Hot on the heels of news of the recent DS9, Enterprise, and TOS stamps, here's another set. 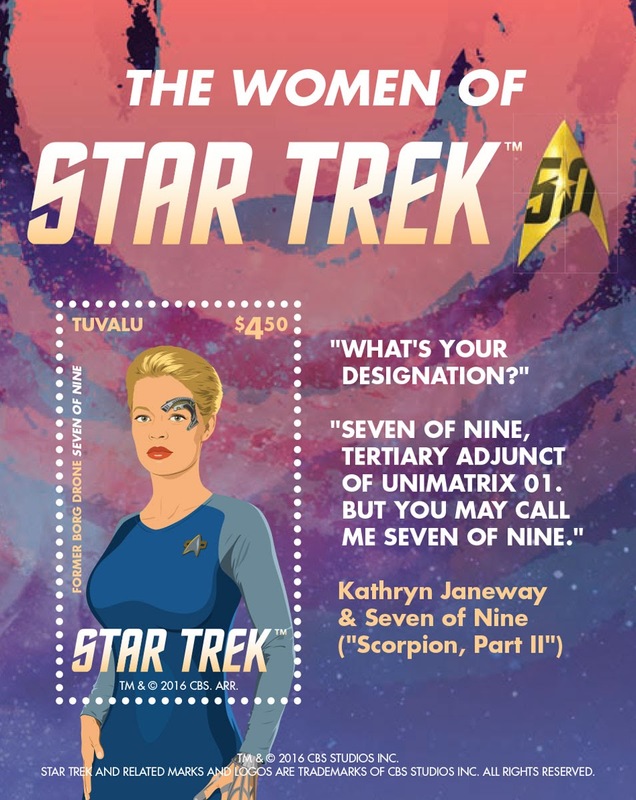 Issued in January by Tuvalu, was the new Women of Star Trek collection, featuring prominent female characters from all the prime timeline series. Like other recent releases, this series comes in the form of two miniature sheets, one featuring six stamps, and the other a single higher value stamp. 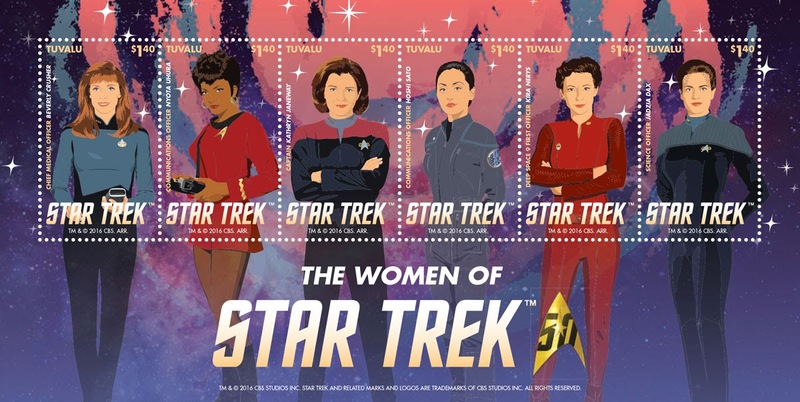 The six stamp sheet stars Doctor Beverly Crusher of TNG, Nyota Uhura of TOS, Captain Kathryn Janeway of Voyager, Hoshi Sato of Enterprise, and two characters from DS9, Kira Nerys, and Jadzia Dax. Seperate from the rest is a second Voyager character, Seven of Nine. These are the first ever postage stamps issued by Tuvalu, but the small Polynesian island is no stranger to Star Trek stuff, having just last year put its name to a series of Star Trek coins. If you don't happen to be visiting any time soon, fear not, the stamps are available to order via the Inter-Governmental Philatelic Corporation, who produce special stamps for countries around the world, including most of the previous Star Trek stamps which have been issued - You can see all of those other Star Trek postage stamps on my Trek Collective List. 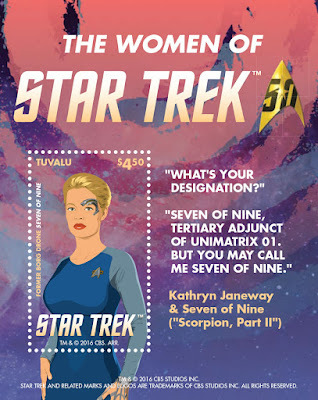 Now read in why Seven had her own stamp. I say the rest were too jealous to allow her onto their sheet. Cliques are everywhere. Deanna is an oversight. Also, not sure how you include Hoshi, a minor character, over T'Pol. Troi, Torres, T'pol, Yar... All before Hoshi. No offense Hoshi, you're still awesome. How do you not include Counselor Troi!?!? Not having Deanna Troi is an insult. She was a major character on ST:TNG!